Below I invite you to browse some examples of my written content for blog posts. Some of the pieces feature a more conversational voice, others a more academic voice. Topics range from Contemporary art exhibition reviews to historical articles on Japanese prints to “How-to” posts on collecting art. I have included an introductory paragraph as well as the ability to view the complete post in PDF form. As always, you can find more of my writing on my blog. When Hokusai published The Thirty-six Views of Mt. Fuji he was in his seventies and already had a successful and prolific career as an artist. 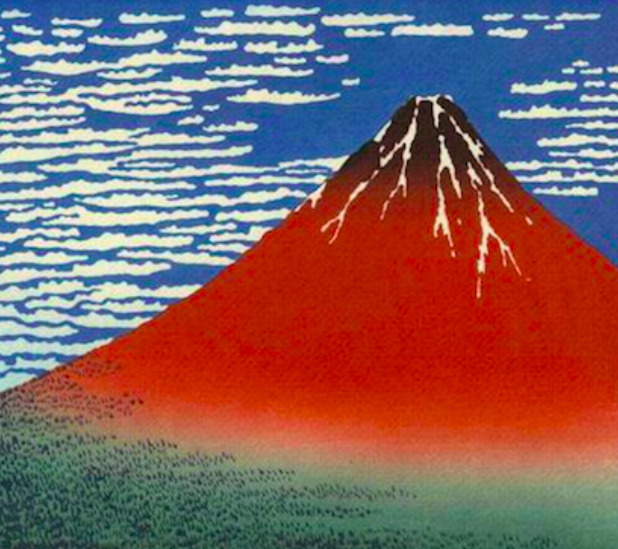 Known for his ukiyo-e prints of actors, book illustrations and historical subjects, here he turned to one of the most iconic and auspicious subjects: the looming, cone-shaped Mt. Fuji. An important symbol for the Japanese dating back centuries, the series was instantly popular and became an iconic symbol of Japanese culture and heritage. Today its prints are highly desired by collectors; Rising Sun Prints is pleased to present a selection of these works for sale. Consider this scenario: You’ve meticulously decorated your home and picked out the perfect rug to match your pillows. But as you settle into your sofa, you see blank walls staring back at you. Or, maybe you love to wander through museums while traveling, and want to come home to some artwork of your own, but think that buying a work of art would break your budget. After all, didn’t someone just spend $450 million on a painting? Having an art collection is sometimes viewed as unreachable, but it doesn’t need to be! We’re here to take away some of that fear and reassure you that if you follow these steps, you’ll find a work of art you’ll love for a lifetime. Philip Gorrivan is an interior designer who isn’t afraid to take risks and be bold when it comes to creating homes for his clients. He knows the importance of considering a client’s personality and lifestyle when it comes to design, and he also knows that every client is different, which is why, having taken these factors into careful consideration, each one of his spaces is different. Having opened his Manhattan-based interior design firm, Philip Gorrivan Design, 16 years ago, Philip has designed for a multitude of spaces and clients, ranging from Park Avenue apartment to rambling country home. For Philip, designing a home is creating a narrative. Often incorporating bold colors, a mix of eclectic furnishings and vivid artwork, all of these elements come together to draw the viewer in and ask them to take a second look and discover the story running through the design.